This Tabletop Witch Boots decoration will be a focal point in your Halloween home decor. Place it on a tabletop, a mantle or anywhere you want a vintage Witch touch. Black boots are made in resin and are open on top for a more realistic look. 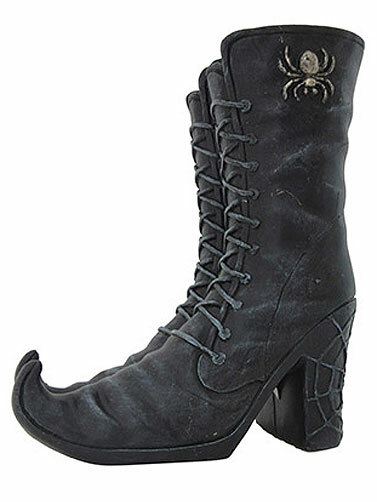 Raised spiderwebs and spiders adorn the boots on the side and heels. Boots are connected and cannot be separated. Tabletop Witch Boots measure 8"H x 4.63"W x 6.5"L.